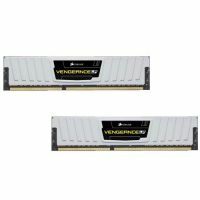 CORSAIR 2x4GB Vengeance DDR3 1600Mhz 1.35V - цена. The Special Edition Arctic White Vengeance Low Profile memory modules operate at the ultra-low voltage of 1.35V, for ultra-quiet systems and other low-voltage applications. Vengeance Low Profile heat spreaders have a reduced height of 1.03" (26.25mm). They re designed for high-performance systems with extra-large CPU coolers, small form factor system builds, or any other space-constrained application where standard Vengeance memory might not fit.